Former Syrian Prime Minister Riad Hijab said today that the Bashar al-Assad regime only controls about 30 percent of the country’s territory, and rebels also claimed this week to have shot down a fighter jet. But are they getting help from al Qaeda? CNN Senior International Correspondent Nic Robertson discusses the speculation and what it could mean in a post-al-Assad Syria. So, is al Qaeda playing a role in Syria? It’s certainly got a lot of experience just across the border in the east to Iraq, and there’s certainly evidence that it has come across the border, that it does have cells operating within Syria. The former ambassadors who we talked to earlier this year said they were already seeing indications of it, and the fighting on the ground does seem to begin to bear that out. [There is] evidence of bomb making and roadside bombs that target al-Assad’s forces on the highways. Suicide bombings have been used as well. So the evidence does seem to be there now. If al Qaeda then is helping the Syrian rebels, what does that suggest for future relations with that country? Well, it’s one of the very problematic parts of the sort of mosaic of opposition forces that there are. You have a lot of people in the opposition. Remember, it began as street protests and it was only because al-Assad’s regime cracked down that they began to take up weapons. So this is something that has grown from a street protest into an armed uprising that al Qaeda has tried to take advantage of. Al Qaeda’s…core level wants to exploit the Arab spring in any way possible. So at an institutional level, they want to exploit it, but how does that affect relations? Well, it’s going to complicate relations because when you support the opposition – how do you know whether some of that support, whether it’s technical or communications equipment or military equipment, is going to end up in the hands of al Qaeda? What happens after Bashar Al-Assad is gone? How deeply rooted have these organizations become? When you talk to people who were involved in the grassroots protest at the beginning, they don’t support having al Qaeda in the country? They don’t want them. They see this is a very worrying and troubling development…This makes them very afraid and more likely to side with al-Assad and it’s more likely to make the war last longer and give al Qaeda the chance to exploit the situation further. We knew that al Qaeda was coming, they were in Afghanistan. They went in to Iraq. Is there any suggestion as to where they’re coming from to get into Syria? Well, the expectation is that some of them will have crossed the border from Iraq, which is on the eastern border of Syria. They would have crossed over that way. But there’s also a sense among many people that al-Assad encouraged al Qaeda to transit through his country to sort of set up on the fringes of it as long as they didn’t destabilize Syria in order to undermine U.S. efforts in Iraq. So in some senses, some of those al Qaeda members will have been lying low on the ground. I am shocked to hear about suspension of Fareed zakaria by CNN on such an inconsequential issue. There was only one informative and intelligent show,GPS, on Sundays that I used to watch and that has now been taken away.I wonder if those questioning his professional integrity are politically motivated because afterall he wasn't your typical American host. Freed's take on domestic and world issues was not that of mainstream media which are out there to please both sides. He expressed what he believed in his heart and that was probably hard to swallow for some. I hope CNN would show fairness. I agree, Sajid. CNN does need to be fair but isn't always as evidenced by the blocking or deletion of some posts here which were not exactly politically correct or in the right-wing political mainstream. Everyone has a right to their opinion, even right-wing fanatics! I was just wondering when those clowns in Washington were going to start crying wolf about Al Qaeda being in Syria. Most Al Qaeda members have already been killed off in Iraq by both the U.S. military hardware and the so-called "Sons of Iraq"(former Sunni insurgents paid off by the C.I.A.). The Washington insiders already know who these so-called anti-Assad "rebels" are and that's why were aiding and abetting them. DID THEY? HOW INTERESTING. NICE OF YOU TO SAY. Assad`s foot soldiers are dying in doorways as they fight thousands of fanatical invaders. Their task is futile because they cannot stop an endless flow of Wahhabi Salafi-jihadists from crossing the Turkish border. An escape route is quickly needed or millions of non-believers and assorted infidels will have their heads chopped off. Al-Assad Govt. was stabilised, but in front of U.S tactics he is a innocent.U.S used Entire power to demolish to Al-Assad Govt. Al- Queda support no need to Assad Garu. What are the chances it could backfire? I mean, what are the chances that in the end all the warring factions will realize they would be better if united? They will see that its them they are bleeding and their common enemies enjoys watching them. Most likely the Al-Qaeda members in Syria came from Iraq, which saw their rise in 2004, the year after the US invasion, when the Jordanian militant Abu Musab al-Zarqawi pledged allegiance to Osama Bin Laden. Known as al-Qaeda in Mesopotamia, they had been responsible for many attacks in Iraq, but the group's capacity diminished from 2006-7, when Sunni Arab leaders turned on them, and the US military launched its troop surge, but they still remain operationally active. growing thug factor in syria. promoted by usrael. the syrian govt controls syria. the thug criminals get routed as they were in libya. only u.s. far away keeps the aggression going. 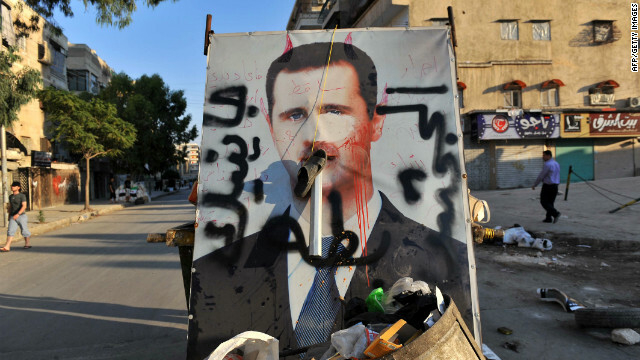 It should be assumed everyone is there hoping to ride on to political power especially when Assad seems bleeding. I am a useless piece of camel dung. I post anti American, anti GB, anti semite, anti India, anti modern anything because I am a good moooooslem. I steal people's monikers because I am so ashamed of myself and post the most stupid comment. When people get angry with me, I claim insanity. I am the same guy. It's not al-Qaeda, stupid. I have been saying this for years, but the media keep using the "Q" word! The so-called al-Qaeda is nothing more and nothing less than the militant vanguard of the Sunni war against the Shiites. They use black colors traditionaly, and black flags. Let's not create a perception that a "vicious" terrorist group is out there. There is no al-Qaeda!